Unilever chief marketing and communications officer Keith Weed took part in a series of talks and media interviews today to press home his key areas of interest, ranging from brand safety and the digital supply chain through to sustainability and diversity. The high-profile marketing chief, a regular attendee to Cannes Lions, started the day speaking at a brand safety event hosted by the Wall Street Journal this morning. Weed argued that its high safeguards in digital media buying meant that the FMCG behemoth did not have to pull spend from YouTube following The Times' investigations that found some brands were funding extremist content. Some brands were quick to pull up Google for bad practice but Weed took a different approach, instead speaking to the tech giant about the problems and found that there were one or two human errors. He said: "I think media companies and advertisers have a responsibility to be doing the best job in buying the right media. [With] programmatic if you don’t run a tight desk then you will drive towards getting the cheapest spot – on a lower brow site." When asked whether the response from brands was overblown, Weed said: "It’s up to them, I think everyone was quick to say ‘bad YouTube, bad Google’. Others said, ‘am I buying media as I should?’. "I think some marketers woke up and realised they weren’t on top of buying as best as they thought." The Times investigation resulted in many companies pulling their advertising but not Unilever. Explaining this, Weed said: "I stayed with [Google] because I wanted to work with them to get the best results. "I think if people go away and say, ‘I want 100% brand safety’, they’re going to have a long journey back." He said the subsequent conversations he had with Google were helpful and helped move the debate along. Weed also attempted to allay concerns that the duopoly of Google and Facebook has too much power over major companies including Unilever. "I have very confrontational chats but I prefer to do it in private. I think business is much better done behind closed doors where you can have detailed conversations." He explained that when he first started talking about third party verification, calling for tech giants not to mark their own homework, a lot of people at Mountain View were upset. Weed added: "It wasn’t until I was there on a one-to-one basis that the penny dropped. I don’t think in public it makes it any better, you need to be very clear in what you want and where you want to get to." On third party verification, Weed said that there needs to be one measurement system across the industry and "until we get there we won’t clean [the industry] up". He added: "The good guys will win, when we get real transparency the ad dollars will go to the good products." What keeps Weed up at night? 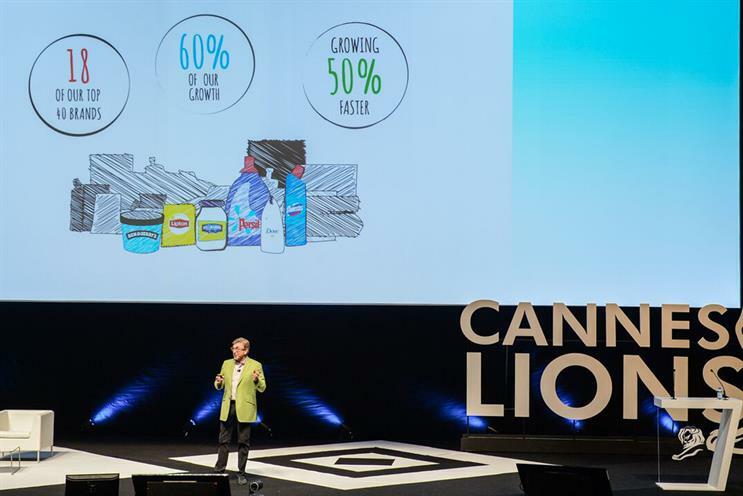 In his keynote speech on the main stage at Cannes Lions and press roundtable after the event, Weed revealed three things that "keep him up at night": how to join the "digital dots; embracing diversity and reimagining creativity. Weed asserted his view that "100% viewability is Unilever’s only acceptable metric" and threw down the gauntlet to the big tech players to come up with one ratings and measurement system. He challenged the big tech players to "facilitate a more efficient media market". Asked by Campaign what it was like working with rival Procter & Gamble on the new Unstereotype Alliance, choosing his words carefully Weed said: "It’s unusual. Different." "We do our summer vacations together, me and Marc (Pritchard), every year," Weed joked. "If it’s going to be an industry initiative it needs to have the industry leaders on board. Martin Sorrell is coming along… It’s an area that Marc and P&G are passionate about as well, it’s not as if I’m asking them to come along to an ice-cream convention," he added. On reimagining creativity, Weed pointed out that "attention is a reward not a right" and that people will block brands out of their lives that they don’t want to engage with. He highlighted that Unilever’s Sustainable Living brands, brands that are marketed with purpose as their focus, grew "50% faster than the rest of our portfolio and delivered 60% of our growth". Asked whether he would another name another key area on his mind, Weed flagged the role of training for marketers, especially in the digital sphere. "We’ve got to be much more passionate about skills and training. In business, training is slightly frowned upon when you get to a certain level. But with the market changing as fast as it is changing people need to continually skill themselves up. I’ve made digital training compulsory, including, by the way my colleagues on the executive." As the training was an e-module, Weed was able to tell who had completed it and when completions stopped at 92% he sent an email out to the remaining 8% to chivvy them along. In the email, Weed told the remaining employees he was going to get their photographs and put them on the wall of his office "because I want to see the people who don’t want a future in marketing". The completions hit 100% soon after that missive went out.